In 2013 Snowdrop Productions resurrected a piece of Canadian Theatre history when it produced The Glass Cage, a play from 1957 by J. B. Priestley set in Toronto. Priestley wrote the play for the Canadian acting siblings, Barbara Chilcott and her brothers Donald and Murray Davis. The play then unaccountably slipped into obscurity until 2013. 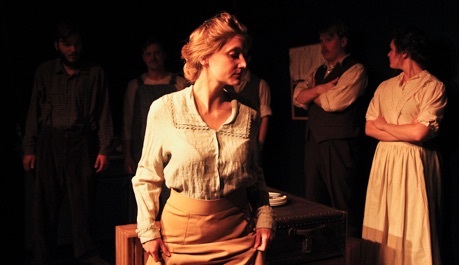 Now Snowdrop Productions with Theatre Double Take has done a second excavation for British plays set in Canada and has found The Land of Promise, a play from 1913 by W. Somerset Maugham (1874-1965). The action is set in England and in Manitoba and puts on stage a vision of farm life in Canada ten years before Merrill Denison’s Marsh Hay (1923) and of life in the Prairies twenty five years before Gwen Pharis Ringwood’s Still Stands the House (1938). Maugham’s play also deals with the stresses of British immigration to Canada, both on the immigrants and on Canadians – a topic neglected by early Canadian playwrights. In fact, Maugham’s depictions of these stresses caused the first tour of the play to Canada to be cancelled. In an excellent article about the reception of the play, Robert G. Lawrence notes that “Canadians were then very sensitive about the 'image' of their country. The Land of Promise suggested that Canada was inhabited for the most part by very rough people”. Besides that, “in this period of Canadian history, immigrants from England were assiduously courted. In 1913, a peak year, approximately 200,000 people from the United Kingdom settled in Canada; thus it is not surprising to learn that Canadian immigration/emigration officials were in the vanguard of the protests over The Land of Promise”. As usual when plays are banned, one wonders whether officials had actually read or seen the entire play. Given how the play ends, it turns out that Maugham, as one might expect from his later works like The Circle (1921), Our Betters (1923) or The Constant Wife (1926), presents much more a critique of the British in The Land of Promise than of Canadians. The four-act play begins in England in Tunbridge Wells. The 28-year-old Norah Marsh (Sarah White) has been a lady’s companion to the unpleasant Miss Wickham for ten years. Her employer has just died and has led her to believe that she will be left an annuity in her will as compensation for her years of service. Norah dreams that she will finally be able to lead an independent life, but, as it turns out, Miss Wickham never got around to changing her will and Norah is left with nothing. An acquaintance of Norah’s, Reginald Hornsby (Matt McGrath), who earns his money through gambling, tells Norah he plans to emigrate to Canada because he’s broke and he’ll have the chance of his own farm out there. Norah, who sees dim prospects of continuing as a lady’s companion in England, is encouraged to think she should emigrate, too, and stay with her brother Ed, who had left a few years earlier. In Act 2, Norah and Reginald discover that life in Canada, especially on a farm in rural Manitoba, is not what they had imagined. Reginald had thought a farm would be something like an English country estate with hunting and shooting. Now he discovers it involves hard work. For her part, Norah, who had her employer’s servants to do the household chores, is aghast that she is expected to do them here herself. The direct ways of Ed (Leete Stetson) and his Canadian wife Gertie (Victoria Houser) she finds rude, while Gertie is unimpressed with Norah’s annoying combination of helplessness with an air of superiority. Open conflict erupts when Norah insults Gertie in her own house. To escape the fraught situation, Norah on impulse asks the hired man Frank (Šimon Mizera), who had been eyeing her, if he still wants a woman to do his cooking and cleaning. Stunned, he says yes and they plan to leave together. Act 3 is probably the strongest act of the play. Here Norah has to comes to terms with what she’s done. Frank lives in a two-room shack, not a farmhouse as Ed does. For the sake of society they have gotten married in Winnipeg on the way to Frank’s place near Prentice. Norah thought she was clear that in living with Frank she would be no more than an unpaid household servant. Frank, naturally enough, assumes that in agreeing to marry him she has also agreed to all of a woman’s wifely duties. Things get off to a bad start when Norah refuses even to act as a household servant. The tension between them escalates until she finally threatens to kill him. In Act 4, Norah is offered the chance to leave Canada and return to England. Maugham crams far too much plot into this one act, but he does succeed in keeping us in suspense until the very last moment about what Norah will decide. The play is quite unusual in presenting Norah, its central figure, first in such a sympathetic light and then, for the middle two acts in Canada, drawing whatever sympathy we had for her away. We can appreciate that she finds herself in new surroundings that are not at all what she expected, but her haughty reaction to them and her seeming pride in her uselessness prevents us from any commiseration. Maugham sets up Reginald as the play’s main comic figure because of his self-confessed allergy to work, but Maugham also shows that Norah’s attitudes only differ from Reginald’s in terms of degree. One of the play’s main flaws is that it is completely unclear how we move from the situation at the end of Act 3 to the one at the start of Act 4. Act 3 ended with Norah planning to leave Frank the next day. 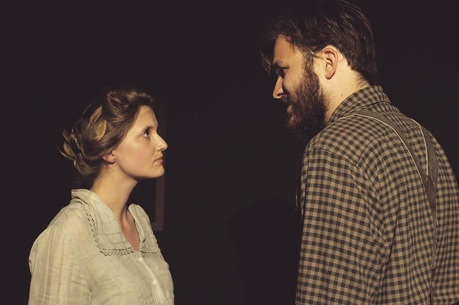 Act 4 begins with Norah having seemingly settled into life with Frank in his shack. What happened? All we hear from Norah is this: “I made up my mind very soon that I must accept the consequences of what I'd done. I tried to fall in with your ways”. But that leaves certain keys questions involving the full extent of her wifely duties unilluminated. Maugham may build up suspense concerning whether Norah will stay or go right up to the last minute, but this means he has also left the majority of her character development until the final act. Maugham labelled the play a comedy, but director Grace Smith rightly does not direct it as one. Smith keeps the focus tight on the rigid character of Norah and the distress that her increasingly wrong decisions cause. For unknown reasons, Smith wants to make sure that we experience the play as a play. Therefore, she used now tired cliché of beginning the action with the actors still warming up and preparing for their roles along with the stage manager’s countdown to the time when the actors must take their places. In a makeshift space like the Red Sandcastle Theatre, where a modern kitchen sink and counter are visible throughout the action, the audience already knows that it is seeing a play. The fact that the actors take seats on either side of the stage when not in a scene is quite enough to achieve the metatheatrical effect Smith wants without belabouring the point. The cast is quite uneven, but there are several fine performances. Chief among these is Sarah White, who succeeds in making Norah an all-too-believable character. White is expert as suggesting that Norah edits everything she says after first running through everything she would like to say but, due to her strict sense of propriety, cannot. This helps her make Norah a fascinating figure especially in the middle two acts in Canada where the distance between what she says and what she thinks grows even greater. White fills Norah with an inner volatility which only becomes more dangerous by being so tightly contained. Šimon Mizera at first gives Frank a menacing aspect in Act 2 only to reveal it in Act 3 as a façade put on for the other men. As an uneducated labourer who knows nothing about women, Frank finds himself in a strange situation we can sympathize with in having to deal with an unhelpful woman filled with disdain for him. Canadians in 1914 may have worried about the impression Frank gives of being “rough”, yet it is Norah, not he, who becomes violent by striking, kicking and biting him. Mizera is excellent in showing that beneath Frank’s frustration is a deep layer of sadness that someone he wants to care for should despise him so much. Leete Stetson plays an important role as Norah’s brother Ed. When Norah visits he finds he is caught between two cultures, the new one in Canada where he is now at home and the old one in England that he wants to forget. Even in his accent Stetson catches the right note of a Brit transplanted to Canada. Like White, he gives depth to his character by showing him revolving many possible responses in his mind before he finally speaks. Victoria House does a fine job as Gertie, who in posture, walk and manner of speech is Norah’s exact opposite. She shows us the increasing strain on Gertie of attempting to be civil to as haughty a person as Norah. Fine, too, is Matt McGrath as Reginald. His gleefully matter-of-fact forthrightness about his inaptitude for work is very funny, and his whole demeanour reminds one of one of Bertie Wooster’s dimmer chums at the Drones Club. Whatever its flaws, The Land of Promise is still a must-see for lovers of Canadian drama and history, students of colonialism and anyone interested in the byways of early 20th-century drama. Theatre Double Take and Snowdrop Productions have done Toronto theatre-goers a great service by bringing the play to the stage. Maugham may use the play to criticize the meaningless lives of the British twentysomethings of his time, but he also provides the invaluable perspective of an outsider on the strength of Canada and Canadians at a time before Canadians began writing their own plays. *Lawrence, Robert G. “The Land of Promise: Canada as Somerset Maugham Saw It in 1914”. Theatre Research in Canada, Spring 1983 (http://journals.hil.unb.ca/index.php/tric/article/view/7474/8533). Photos: (from top) Sarah White, Matt McGrath, Luke Slade, Leete Stetson, Šimon Mizera and Victoria Houser; Sarah White (foreground), Šimon Mizera, Luke Slade, Leete Stetson and Victoria Houser (background); Sarah White and Šimon Mizera. ©2015 Cameron Walker Fox Revett.